No Modi wave in 2019; both grouping could fall short of halfway mark; What then? YSR after meeting the CEC in Delhi. Bharatiya Janata Party (BJP) President Amit Shah's visit to Andhra Pradesh, the meeting of YSR Congress Party chief Y. S. Jaganmohan Reddy and Chief Minister N. Chandrababu Naidu with Chief Election Commissioner (CEC) Sunil Arora on Monday have stepped up poll activity in the state. Shah was on a visit to north Andhra to interact with BJP leaders in five Lok Sabha constituencies and to sound the poll bugle at public meetings. While BJP chief arrived in the state, Jaganmohan Reddy dashed off to New Delhi to meet the CEC and seek his intervention for free and fair elections. Simultaneous polls to the Andhra Pradesh Assembly and the Lok Sabha are likely in April-May. 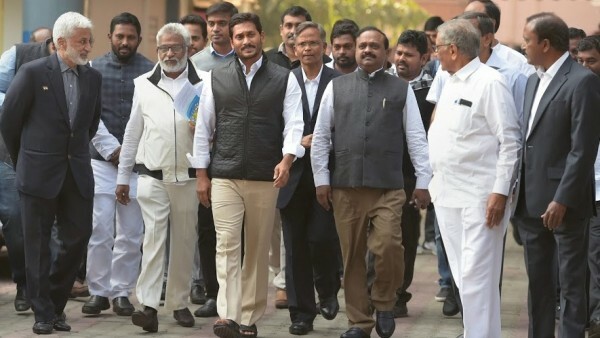 Jagan, as the leader of opposition in the Andhra Pradesh Assembly is popularly known, sought deletion of nearly 60 lakh voters from the voter list, saying they were doubtful voters and were included at the behest of ruling Telugu Desam Party (TDP). He also alleged the TDP had parked Rs. 4,000-5,000 crore in all 175 Assembly constituencies for distribution among voters. Jagan also claimed Naidu was giving out-of-turn promotion to police officers of his community. Interestingly, Naidu reportedly conveyed his doubts about the electronic voting machines (EVMs) to the CEC and demanded use of paper ballot in the coming elections. The TDP chief remains ahead of his political rivals in poll preparations. He is holding tele-conferences with TDP leaders every day under the Mission 2019 to enregise them and also share his thoughts on various issues. By announcing sops to various sections of people on almost daily basis and by attacking Prime Minister Narendra Modi for ‘betraying’ the state, Naidu is keeping the pressure on his rivals. The day-long shutdown by a group fighting for the special status to Andhra Pradesh also came handy for the TDP. The ruling party not only extended its support to the shutdown but Naidu and his party legislators also wore black shirts in the Assembly to protest the Centre’s ‘unjust’ attitude towards the state. Naidu plans to take his ‘Dharma Porata Deeksha’ to New Delhi next week by staging a protest in the national capital. Leaders of the Congress and other non-BJP parties are likely to join the protest. Political analysts say Naidu is using every opportunity to target the Centre for going back on commitments made at the time of state’s bifurcation and project himself as the champion of state’s rights. Naidu is also training his guns at the BJP leaders for their frequent visits to the state. “Shah had no time to visit north Andhra when it was hit by the cyclone Titli. Now he is coming to play politics,” he said and asked TDP cadres to protest by wearing black badges. Naidu is also visiting New Delhi regularly to meet leaders of the Congress and non-BJP parties. Be it the issue of EVMs or the alleged vendetta by the Modi government against its political rivals, he is lending his voice to opposition parties. Join us on: © 2019 CurrentNews.